Let's face it, this model is a behemoth. One need only look at the size of the box to realize that. 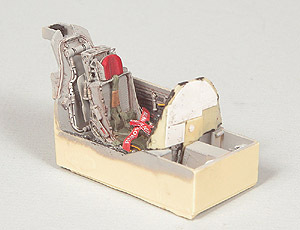 It contains over 500 pieces, easily a quarter of which are armament. Two Bobs did the artwork for the decal sheet and it is gorgeous; I really see no need to look elsewhere for decals. One of the very first things I noticed about this kit was the veritable proliferation of ejector pin and sink marks; a considerable amount of them in very visible locations. I find this very disappointing (and unacceptable) and removal of them will be time consuming. Because of the size and weight of the finished model, I decided to replace the kit main struts with metal ones from Scale Aircraft Conversions. The castings are a little rough and are going to need a fair amount of cleanup and polishing, no biggie. 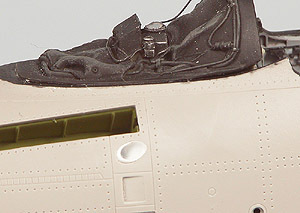 One thing normally out of character for me is I am using the Black Box resin cockpit in lieu of rebuilding the very basic (and not uncharacteristically for Trumpeter, inaccurate) cockpit. I won it at a contest raffle so it is silly not to use it. It is literally a kit within a kit. 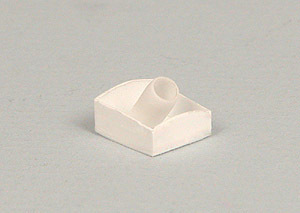 Besides, it will save me a huge amount of time and about 20 pounds of styrene to correct the woeful kit 'pit. 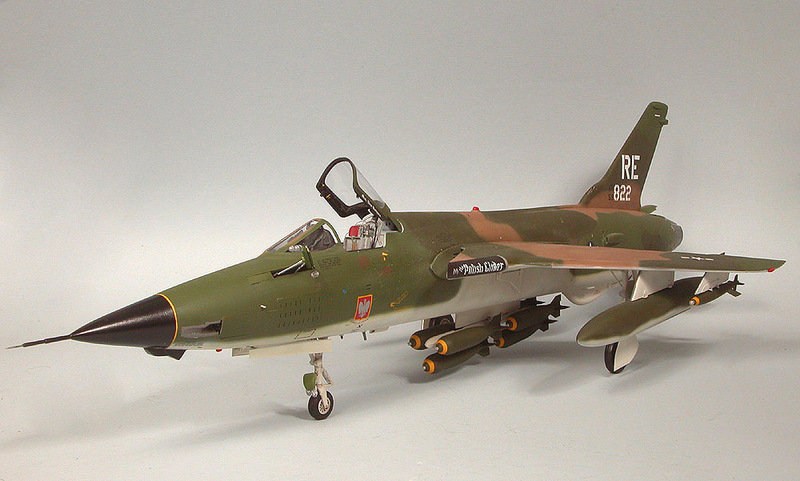 I am fortunate to have a 1:1 scale model of an F-105D an hour's drive from the house at the USAF's Armament Museum near Eglin AFB. I took many reference photos there before beginning and will probably take more before I am done. As I previously mentioned , this is going to be a very heavy model. The instructions call for 110 grams (3.88 oz.) 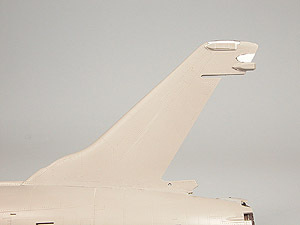 of weight in the nose to offset the tail. I think this is perhaps conservative so I will add about 25% more above that just to be on the safe side. Subsequently, there is going to be a lot of stress on the nose strut to support all this weight. I got white metal main struts but could not find a metal nose strut. 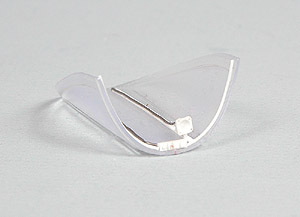 I know there are some currently available but when I got the metal ones two years ago they were not so I do not see the sense in getting a whole new set just for the nose strut. 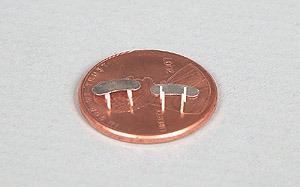 To that end, I am going to beef up the kit pieces with steel pins. I have a supply (though dwindling, admittedly) of 0.030" steel pins from an old contour gauge that are perfect for the job. I first CA'd a piece of 0.125 x 0.25" styrene block (Fig. 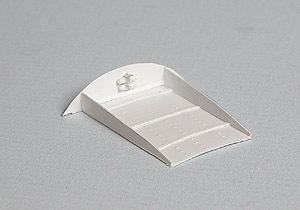 1) in two places to the outside of the nosewheel well sides to serve as a reinforcing block. Overkill perhaps, but it will be more than adequately strong. It is much better to err on the side of caution. I ground a channel into the nose strut halves using a 0.033" carbide drill bit (Fig 2) and bent a piece of the 0.030"wire to fit inside of it. I used liberal amounts of CA to affix it in place and then ground any bits protruding above the channel flush with a Dremel cut-off wheel. This will significantly strengthen this strut at it's weakest point. 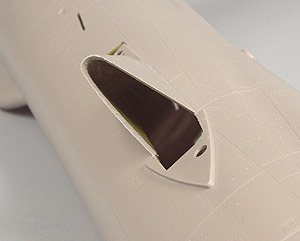 Likewise, I reinforced all attachment points for the other nose strut pieces with steel pins where they will insert through holes drilled in the styrene reinforcing blocks. I did not have handy any metal rod or tube of appropriate size for the inside of the strut so I did the next best thing; I strengthened a piece of 0.080" styrene rod with a steel pin and inserted that into the strut (fig. 3, lower right). 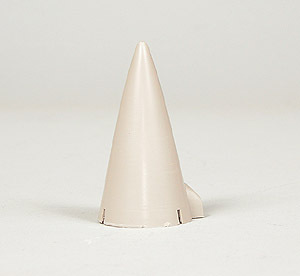 The pin extends past the styrene to mate with the top half of the strut, adding rigidity to the entire structure. This little project was good for close to two hours worth of work however the benefits gained far outweigh the time required. This strut will not break or deform under load for any foreseeable amount of time. I am not following any specific order as this time, just whatever interests me at the time. 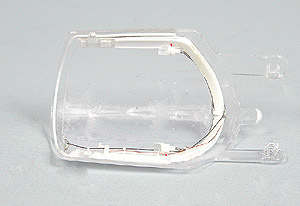 Like the rest of the kit, the clear parts are very large. Quality is not as good as I would expect from a kit in this price range but it's acceptable. 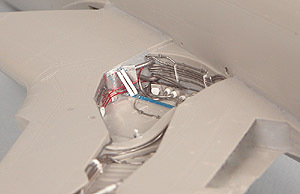 Areas of the canopy and windscreen that would be occupied by framework are lightly frosted, which makes it easier to distinguish demarcation lines. The windscreen had a scratch that ran along the inside of it so I had to polish it out, no biggie. 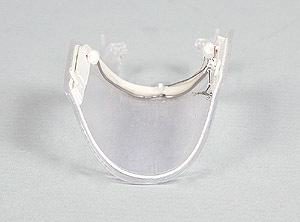 As soon as I removed the canopy from the sprues I noticed something that I have never seen in all my years of modeling.....THERE WERE FINGERPRINTS ON THE CLEAR PART! I was floored. Fortunately the oils and acids on that person's fingers had not etched into the plastic. I cleaned them off with detergent and water and coated them with Future™. Both the canopy and windscreen were totally void of any details. Since there was a fair amount of structure on both, the canopy especially, I constructed it from reference photos using styrene, solder, wire and soda can aluminum. All in all I added about 40 pieces to the canopy. I added a control box and wet compass to the windscreen along with a few bits of styrene for framing details. I will insert a Waldron instrument in the wet compass when it's been painted. The kit did not come with any mirrors for the front canopy bow (there are two) so I cut some out of soda can aluminum, removed the paint on one side (leaving the plastic coating on the other because CA adheres to it a lot better than to the bare metal), with 0000 steel wool and then polished it with the Dremel and some Turtle Wax Clearcoat polish. I may glue some aluminum foil onto them after they are painted as that will give as close to a mirror finish as you can get. Polished aluminum is pretty shiny but aluminum foil is better. I made the attachment points out of some 0.010" x 0.020" styrene strip. They will be attached to the windscreen right before it is installed because they are very fragile! I found several photos of THUDS sitting on the ramp or in revetments with their drag chute doors open so I decided to leave mine open too. If nothing else it adds a little bit of interest to the tail section. Trumpeter allows the option and does a pretty decent job doing the door. Where they fell short, by a country mile short, is they did not close off the bay. If you leave it open you will be looking at the top of the engine, which simply did not happen. No way you could lay a nylon parachute on top of the afterburning section of an engine. I used a contour gauge to get the shape of the interior and built a box to go around the opening. I only had one photo of the insides of it so I did the best I could. 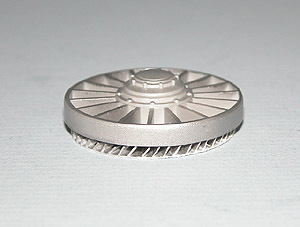 Raised rivets were made by turning the styrene over and running a ponce wheel over it to make raised impressions. Simple but effective. When all is said and finished, the improvement was well worth the effort. At this point I have joined the fuselage halves. Fit between the halves for the most part was very good. Not a lot of seam cleanup is going to be required. A fair amount of touch-up rescribing will be required because this model has a lot of panel lines. Next up is to address the incorrect shape of the vertical tail. Much has been said about the shape of the Trumpeter tail. Before I took the razor saw to it I searched the web for a good while to find a photo of a THUD from an exact side plan form view. I finally found one. 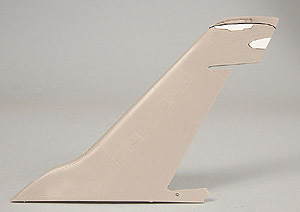 I photographed the kit tail, still on the sprue (though I taped the rudder in place) and cut it out in Photoshop. I outlined it with a fine black line and increased it's transparency. I then superimposed it over the photo of the real thing. I immediately noticed that the kit tail was too tall and that the ECM fairings were in the wrong place. Any slight differences in shot angle of the two photos would not account for the height and location differences. Lowering the top of the tail will be a pretty easy task. Moving the ECM antenna fairings are going to take a lot more work. The first thing I did was to cut out the four ECM fairings with a #80 carbide drill bit in my battery operated Dremel (because it turns at a slower speed than the lowest setting on my AC one), using great care not to break it. 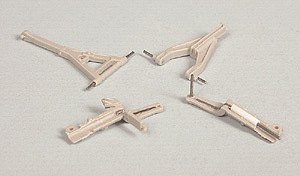 They are so sharp that they really work the best for cutting out small parts. I then cut pieces of 0.030" thick styrene sheet using the holes as templates and filled them in, using CA to fill any gaps. The pieces were then sanded smooth with files and sandpaper and polished with 0000 steel wool. Next up was to take the razor saw and remove the top .18' or so from the tail and reshape the top contour to match the photo. The thin black line in the photo at right delineates the new top of the left piece compared to the original right piece. From a distance you can see how much of a difference there is. The top of the fin was filled with CA and the ECM antenna fairings replaced in their correct locations. With the tail modifications finally completed, it becomes apparent how far off the kit pieces were, the lower antenna especially. Was it worth 4 hours of work to correct it? Most people might say no but I figured if I am going to correct other glaring errors in this model (the radome and drag chute compartment to name two) I may as well do all of them. I know there is a resin replacement for this fin but why plunk down a bunch of money for someone else's work when I can do it myself and get the same results? The kit includes the fairing just behind the radome for the combat camera but once again there is nothing inside, leaving yet another Trumpeter signature black hole. 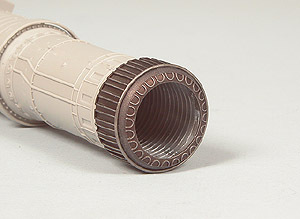 I constructed a box out of sheet styrene and made a lens out of styrene tube and clear sprue. In this scale it would be noticeable that there is nothing behind the "glass". At this point it is time to attach the wings to the fuselage. I plan on leaving the flaps and slats down but will probably just glue them in place. 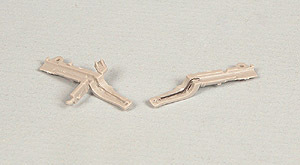 The hinges included in the kit do not appear to be very strong. Once the wings are on I can start detailing the main wheel wells. Before I could start putting the wings together I had to accomplish several tasks. First off was to fill in several very large (0.20") ejector pin marks in the intakes. 500 pound bombs don't make holes that big and I should know, I have dropped my fair share of them. One was actually raised for half of it and sunk for the other half. This is totally unacceptable for a kit of any price, much less one that costs a C-note or more. Additionally, there is a rather pronounced (0.050") step on the fuselage intake area that lies barely 1/2" inside the intake. Granted, I may not have any photos of the inside of a THUD intake but I would be willing to bet my next paycheck that this step is not there in the real thing. And they would be very visible in the completed model if not corrected. The easy way out would be just to make FOD covers for the intakes but I want them open. I took the Dremel and a grinding bit and ground away the step, tapering it to a knife edge so it would not be noticeable once the wings are in place. 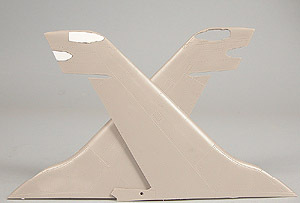 When the wings and fuselage are joined it will give the impression of a continuous surface. Wing construction was fairly straightforward, to a point. 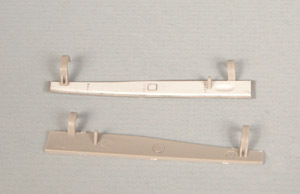 Trumpeter provided two separate sprues for the port and starboard wings. (Western?) 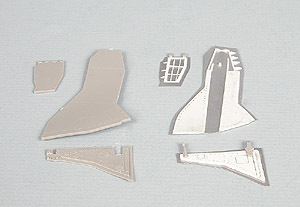 logic would dictate that ailerons, flaps, slats and spoilers on one sprue would mate with the corresponding wing halves on that sprue. As the inimitable John Belushi (aka "Bluto" from Animal House) would have said "But nooooooo!". 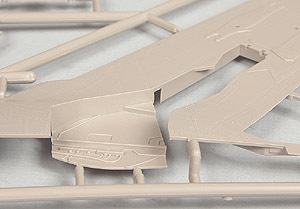 Ailerons, flaps, slats and spoilers for one wing are found on the sprue for the other wing and vice versa. I am still shaking my head in bewilderment over that one. It left me wondering what Confucius would have had to say about that one; perhaps "Sum Ting Wong!". 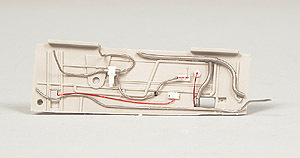 They do provide some metal rods and PE parts so you can make the flaps and slats positionable. At a quick glance, they did not appear to me to be particularly substantial and I was right. Mounting the flaps was straightforward, however trying to mount the slats was an exercise in utter frustration. I finally glued the wings together without them and will mount the slats once everything is dry and I clean up the awful seam that runs down the area directly behind it. 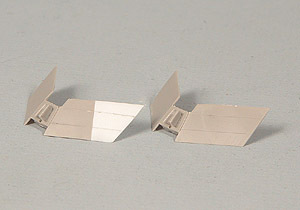 The kit also provides separate spoilers so they can be positioned either up or down. 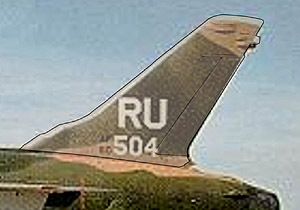 The only time spoilers would be extended is if the aircraft were on rollout (to shorten landing distance) or maintenance was being performed on them. Therefore I decided to display them in the stowed position. The fit was less than perfect, a seemingly all too frequent occurrence with this model, necessitating that each piece be individually fitted. Another unnecessary time waster. There was also a pretty nasty seam on the inside of the intake when the wings were joined but some filling with CA and filing and sanding . 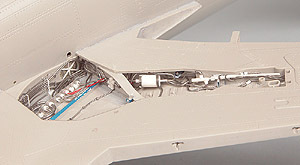 The fact that the area is easily accessible before the wings are joined to the fuselage made this an easy task. The landing gear doors are going to also need to be re-done. They are very thick and, in the case of the main doors, totally void of detail. Since I was working from essentially nothing, good planning was a must. I traced the kit piece onto a piece of 3" x 5" index card and then drew in all the detail. I then cut out the pieces of the card and traced them onto the sheet styrene with a pencil and cut them out with a fresh #11 blade. I also used the kit pieces as templates and cut out new pieces from soda can aluminum. The only thing I will save from the kit doors are the hinges. I added styrene sheet to the aluminum to build up the center parts of the doors. As the photos at right show, the difference is quite noticeable. 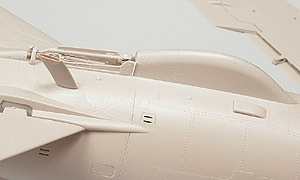 Once again, for an aircraft in this scale, Trumpeter should have done a considerably better job than they did. As bad as the main landing gear doors were, they did not even approach the nose gear doors. I got irritated at the main doors, I got downright furious at the nose doors. Not only were they very thick and totally lacking in detail, they were covered in four nasty ejector pin marks. 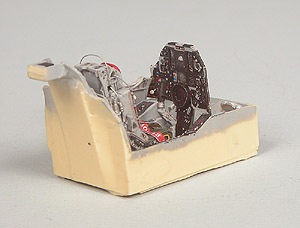 I have seen 1/72 and even 1/144 parts that were far better done this. For 1/32 it's totally unacceptable. Once again I traced the outline onto soda can aluminum and added sheet styrene to form the inner body of the door. Like the mains, I kept the kit hinges but that was it. The rest are destined for the trash where they belong. There are a few other things that need attention before I start on the external stores and ordnance. 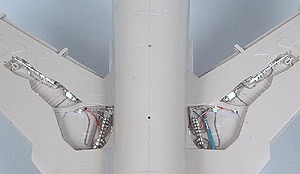 First up was the doors for the inflight refueling probe. Like all the other doors in this kit, they were extremely thick and completely devoid of detail. I once again traced the outline of the door on soda can aluminum and cut out some sheet styrene for the center of the door. I used a file to make a groove down the middle of the door where it will mate with the probe. 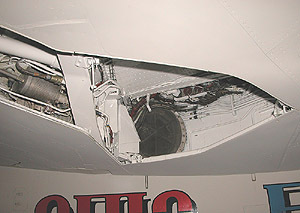 There is a second door, forward of the main one, that closed after the probe was extended. All that needed to be done on that one was thin the edge that would be visible, no point in doing more work than is necessary. 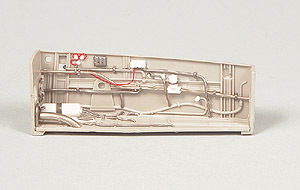 Jets have numerous drains along the underside of the fuselage, especially around the engine. Using reference photos, I drilled several 0.027" holes and inserted pieces of 0.025" rod with a 0.0135" hole drilled in the end. The fuel dump mast had a basically solid end to it so I drilled it out and inserted four pieces of 0.010" wire through the side of it. Sometimes it's the little details! 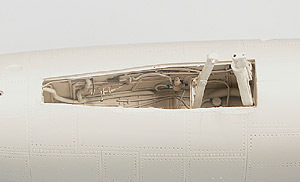 There is a large vent on the port side of the fuselage just below and aft of the inflight refueling probe bay. In the model it is simply depicted as an oval depression. On the real thing there is a definite hole there. I ground out the oval with a Dremel and grinding bit and inserted a piece of styrene tube into the hole. I thinned the edges to near scale thickness with a round file. I also ground out the cooling slots in the door covering the M-61 20mm Gatling gun with a 0.020" carbide drill bit. 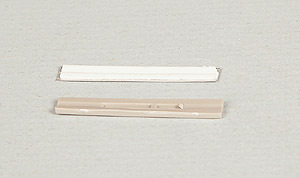 As you can see from this photo, there is a gap between the resin coaming and the kit piece. I filled it in with some strip styrene as it will be noticeable. 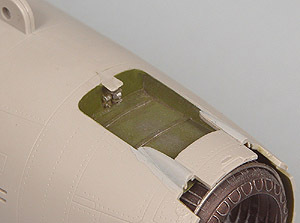 The first thing I noticed when I started looking at the external fuel tanks and armament was part of one of the drop tank fins had been torn in half. It was not in the bag so I had to fix it with some styrene sheet. Unlike so many models that depict fins on drop tanks as thick, rectangular cross section slabs, Trumpeter actually made these very thin and tapered, a nice touch. I cut off the bad part of the fin with a Dremel circular saw and added a piece of 0.025" styrene sheet, adding the taper with a Dremel shaping bit and files. A little bit of rescribing and all fixed! The rest of the drops went together well but a fair amount of filling with CA was required where these fin sections fit into the tank itself. I made up six M117 750lb GP bombs and two Mk82 500 lb GP bombs. The fuses supplied with the kit were somewhat crude so I reworked them, adding some soda can aluminum to simulate the spinner blades. For the most part the kit went together reasonably well. Fit was excellent in places and pretty poor in others. The windscreen fit rather poorly, requiring a lot of filling, filing and sanding. Trumpeter's system for attaching the slats was totally inadequate. In addition to being very weak, it was also very inaccurate. 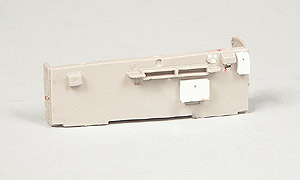 Trumpeter's system for the flaps and slats was fragile, and in the case of the slats, fictional. I decided to just glue them in place in the up position. I drilled holes in the top of the metal landing gear and inserted a 0.030" steel pin. 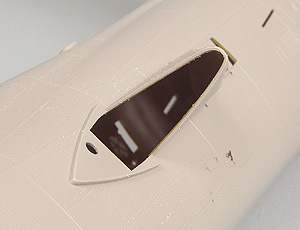 I then drilled a hole all the way through the wing where the strut was attached. I cut off the pin and grounded the area flush with the wing. The struts themselves were affixed with a liberal amount of CA and the pin added a good bit of rigidity. I don't anticipate any problems with either the main or nose gears. I sprayed the model and the myriad number of free parts with automotive primer out of a rattle can. The sheer size of this model pretty much makes this a necessity. 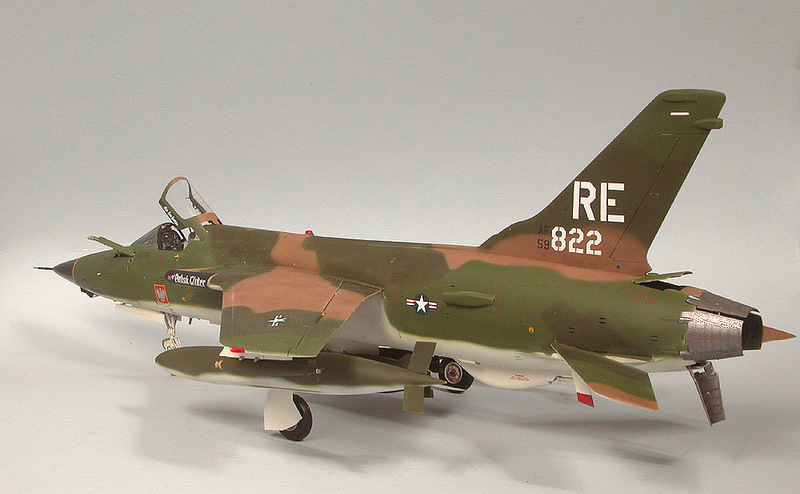 I painted the model in the standard four color SEA (Southeast Asia) pattern of FS 36622 camouflage gray) for the undersides and FS30219 (tan), FS34079 (dark green) and FS34102 (medium green) for the upper surfaces. 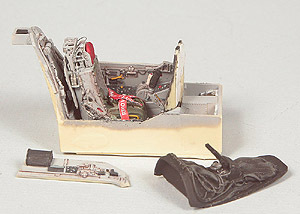 Bombs were painted FS34079. Painting something this large was quite an undertaking; the process took me about five hours to complete. 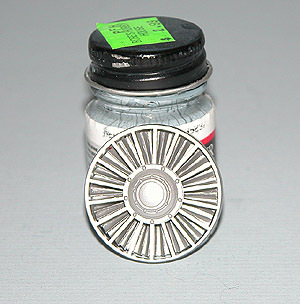 Once the enamels were dry I sprayed the model with two coats of Future™ to prepare it for decaling. The decals supplied with the kit are designed by Two Bobs and printed by MicroScale. They are gorgeous so I saw no need to look elsewhere or make any for myself on the ALPs. They went down very easily and once dry the carrier film was all but non-detectable it was so thin. 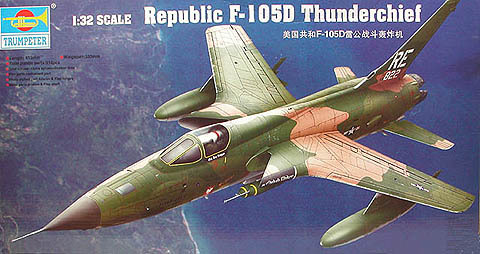 This build was profiled in FineScale Modeler Magazine.